A blueberry is a berry, a very small fruit. It grows in a type of tree called a shrub. 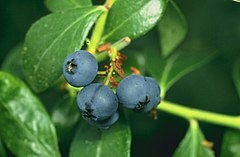 Many types of blueberries grow in North America and eastern Asia. Blueberries are more common between May and October. Blueberries have a sweet taste, with a little acidic hint. Wild blueberries have a stronger taste. Blueberries are good for making jelly, jam, pie, muffins, and many other foods. This page was last changed on 4 February 2014, at 13:22.